What are the benefits of taking time to make my own Jewellery? Making your own jewellery is fun and rewarding. It gives you a sense of achievement when you wear your creations. You feel very proud of yourself and you feel especially proud if when you give your creations to family and friends and you see them wearing them. Creating memories with your own Jewellery. Jewellery making has other uses too. The items you create will hold a special personal spiritual meaning to you. 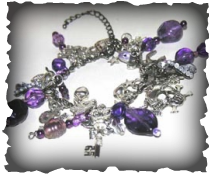 You can create you own special meditation beads or a charm bracelet that you can add to at anytime. Each charm can represent something different -- from mementos of special occasions, to little reminders of loved ones. Whatever you create when you start beading and creating, you will always cherish the memories of learning something new and gaining a new skill.